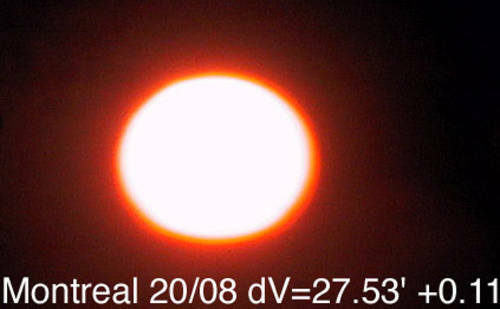 At about 2 degrees elevation, the sun disks are noticeably rounder (left and center) in a summer temperate climatic zone than in Arctic winter (right). Even at this high elevation, differential refraction differences are very significant. This is compelling evidence suggesting that the overall contribution in refraction elevation boost from the entire air mass is quite significant. 0.8 degrees. 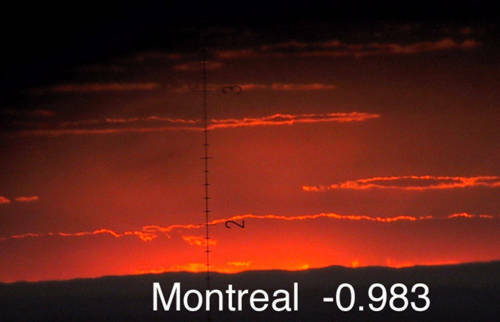 Warm to cold comparison is rich with contrasts, Montreal had no green nor red flashes (center) while Resolute had a prominent red flash below, the flash was so thick that it affected its differential refraction reading. Montreal was rounder while Resolute (in April) would have been more flatter was it not for the extra red mirage. 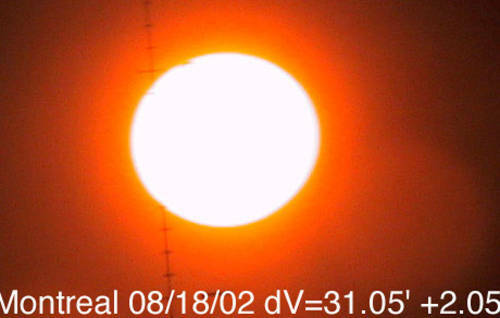 0.2 degrees again is a good example of strong shrinking of the sun disk by cold dense air, almost 4 minutes of arc difference at exactly the same elevation. The contrasting colours should be considered between center and right examples, as an identical filter and camera setting was used for both of them. 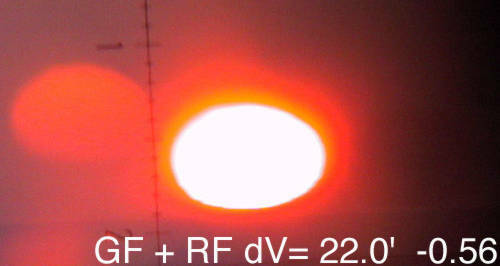 Again, at 0.5 degrees, differential refraction difference between warm and cold was large, again with 4 minutes of arc. The center picture was with filter, the two others without. 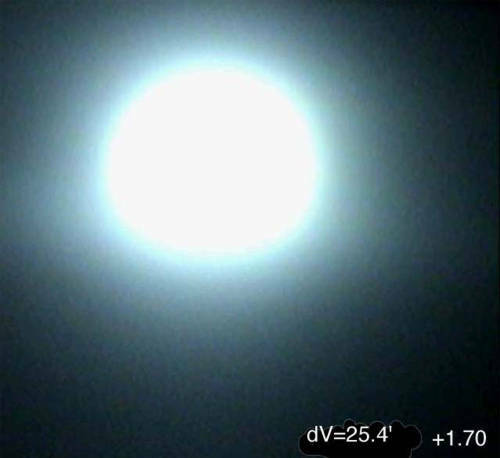 The cold picture had very thick green and red flashes reducing its rectangular aspect, this changed the sun disk to look very much like an egg. 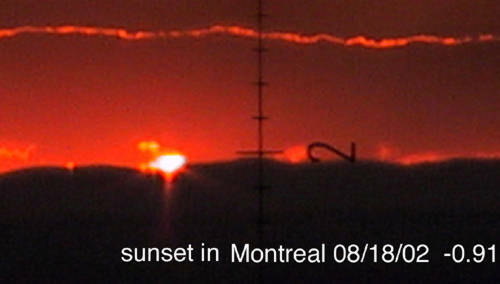 Montreal on the other hand was quite round except for the lower sun limb, a textbook flat bottom rule #1. -0.9 degrees (astronomical elevation at the sun center). 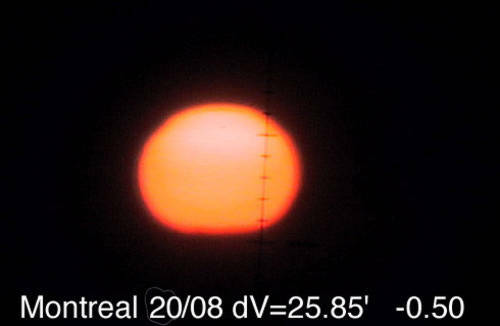 Sunrisesunset.com, a good sunset calculator from the internet, calculated this sunset perfectly for warm air, while in the North the same program utterly failed on every occasion in very cold air. 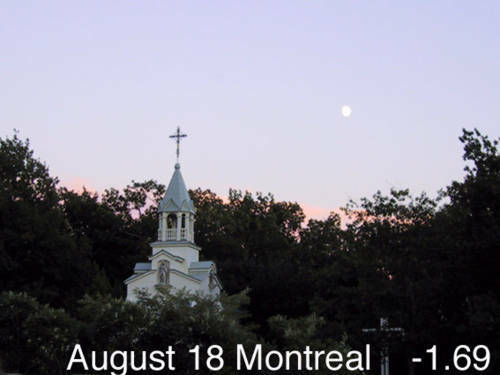 The difference in sunset elevations between August 18 and 20 in Montreal was caused by a somewhat colder air mass coming from the West. 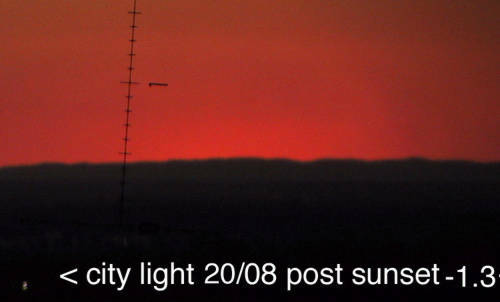 The sunset on the 20th occurred a few hundred of degree lower than on the 18th. 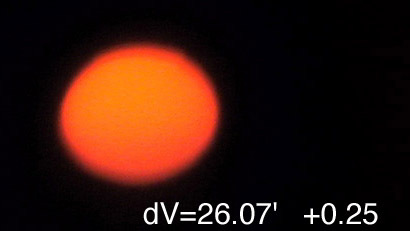 The cold April 15 example is a complete yet compressed sun with round top and almost flat bottom with a small elongated red flash. 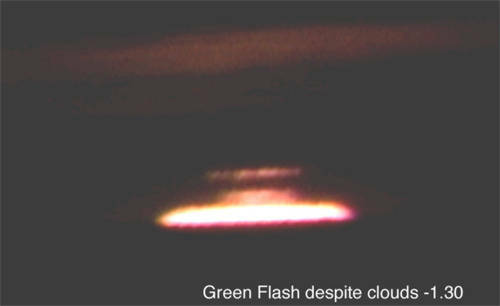 The center picture had a minuscule green flash on top of the upper limb, this flash lasted for a very brief period of time, while up North Green flashes last up to 10 seconds or more. -1 degrees. 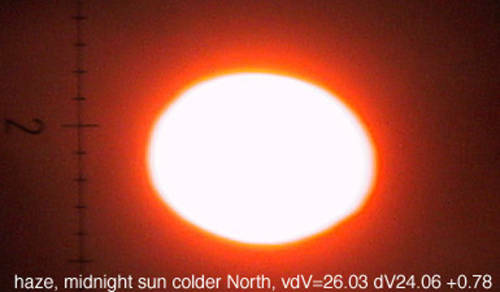 While the sun disk has completely disappeared from the horizon in warm air, cold air boosted the sun disk very well above. No filters were used on all three pictures having the same camera setting, show a great difference in sky colours. As far as I know, there are no examples of Temperate or Tropical sunset sightings below this elevation without the presence of some cold air. -1.3 degrees. 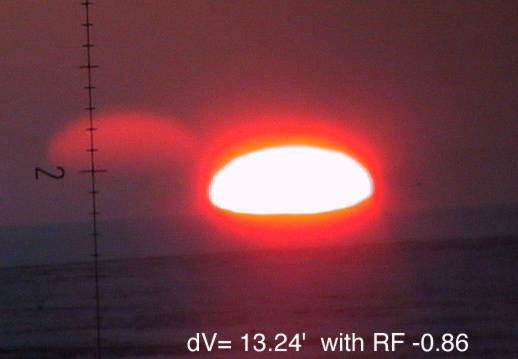 On most given occasions Arctic sunsets should reach this low elevation during winter. 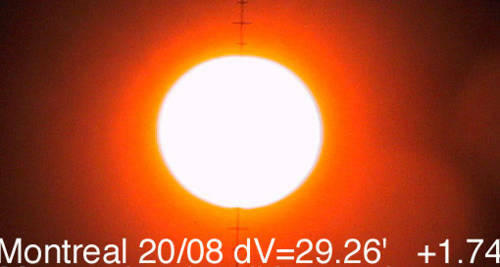 While in warm air there are no such thing as a sun disk below 1 degree. 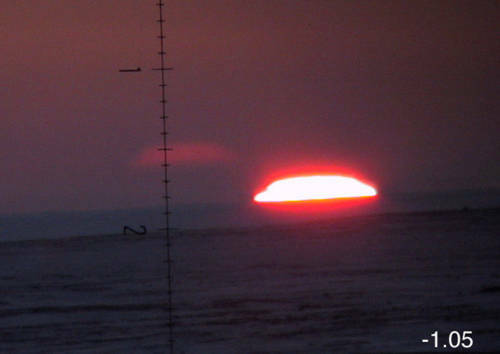 Rule #3 is in effect for this Arctic picture, the compressed sun exhibits a tremendous number of Green flashes above as described by rule #2. The distinction between a #1 and #2 type is obvious, at least in this case, by the width of the multiple green flashes above the shrunken sun disk. Two different cameras were used. -1.8 degrees. In the Arctic, it is not unusual for the sun disk to be seen well below 1.77 degrees, especially when the upper air is extremely cold. The cold April 4 picture was taken with the same camera as with the center example. Note dramatic sky colours differences. 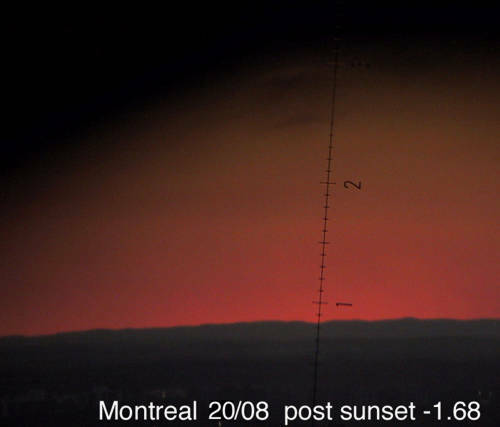 At 2.3 degrees, the sun is well below Montreals horizon, while in not so rare cases it is still above the ground in much colder air. March 14 Polar example is a pure rule #3 debate. 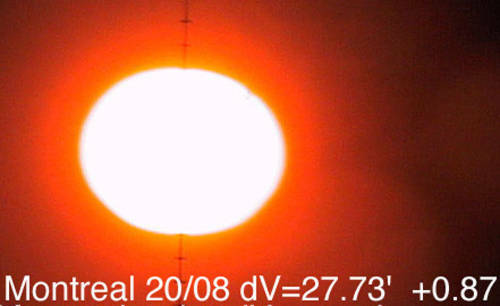 It is most likely the sun line, some may call it a mirage as well, there is a distinction between the sun line and a Novaya Zemlya effect, which needs to be refined with greater resolution optics. 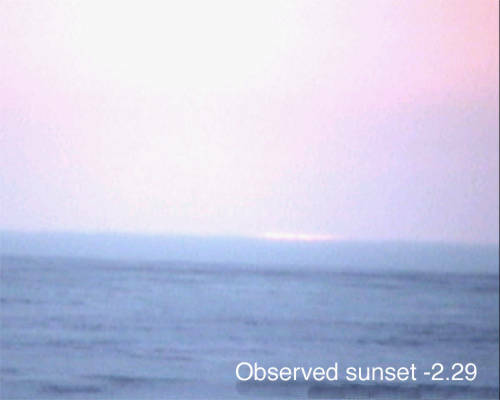 But there is no doubt about one thing, without the presence of cold dense air, this sighting is impossible well below the horizon. COLD vs WARM AIR: Comparing data gave a few basic rules. 1- A colder atmosphere always causes significant upward refraction elevation boost accompanied with vertical sun disk shrinkage. 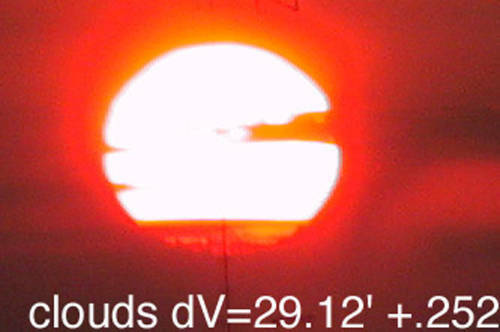 2- Distortions and mirages on or near the sun disk are caused by the presence of different air densities in the immediate vertical vicinity of the observer. The quantity of distortions and mirages are proportional to the number of inversion layers, they depend on position of the observer with respect to the inversion(s) within the observed area. 3- Rules #1 and #2 are distinguishable. Click the links below to display different elevations. Tom Ruens web site shows a remarkable rule #2 during mid summer, remarkable by its likeness to winter observations. 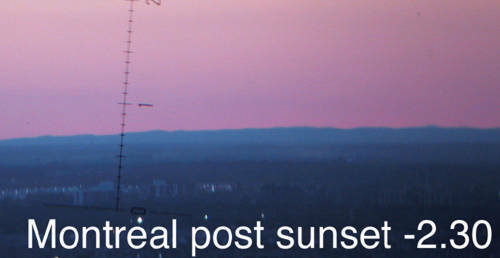 But the sunrise displayed came right on calculated schedule. 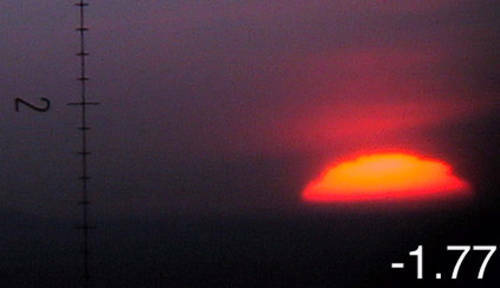 This sunrise penetrated cold air surface caused by cool Lake Superior. The absence of very cold Upper Air caused this sunrise to be on time, proof of Upper Air boosting can be inferred by this data. Great Thanks to Andy on some input with respect to the suggested rules.